PROVIDENCE, RI, July 21, 2016 – In Antarctica, Amundsen, Scott and Shackleton are among the adventuring giants whose legends live on. Today intrepid travelers can replicate the spirit of their on-land experiences, albeit more comfortably, while spending a night ashore wrapped in a warm bivvy sack surrounded by ice, snow and sky. 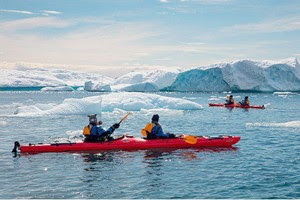 Sea kayaking is also an activity growing in popularity on expedition cruises to both Polar Regions. Poseidon Expeditions’ M/V Sea Spirit, a 114-passenger luxury vessel, offers optional kayaking excursions through their exclusive Sea Kayak Club in both the Arctic and Antarctica on sel ect voyages. About Antarctica Camping: M/V Sea Spiritprovides quality synthetic mummy-shaped sleeping bags rated for temperatures to -18ºC (0ºF). The bags are comfortable, roomy, water-repellent and connectable, accommodating body lengths of up to 6.5 feet. Guests are also issued a freshly laundered cotton sleeping bag liner and a full-length insulated foam sleeping pad. Guests may opt to sleep under the stars singly in a bivvy sack that slips over the sleeping bag. This is a non-complicated option that allows the utmost connection to the environment without sacrificing warmth and protection fr om the elements. These waterproof, breathable nylon bivvy sacks feature contour hoods and provide an additional 5º to 10ºC (9º to 18ºF) of insulation. Partners may also opt to sleep in a deluxe two-person stable, waterproof, freestanding dome tent instead. These measure 87 x 49 inches with additional vestibule space for gear. Guests opting to bivouac, dig their own fox hole in the frozen world. They have access to a toilet tent for use during the time spent on shore. However, their last meal on the ship has to last them until their return to the ship the next morning, as no food is allowed ashore. Neither the date nor the location of camping is known more than a few hours in advance, as a site must be scouted and weather conditions assessed just before venturing out. Guide tents are clearly marked. Children between ages 12 and 18 at the time of their voyage are allowed to participate in Antarctica Camping only if they are accompanied and supervised at all times during their camping activities by their parents or designated representative. All that’s needed is a sense of adventure and willingness to add a $250 supplement to their cruise fare. About Poseidon Sea Kayak Club: Kayaking has been offered as an optional activity on expedition cruises to the polar regions for the past 10 years, and Poseidon wasted no time in making it available for its inaugural Antarctic season last year. The club is limited to eight guests per voyage in the Arctic and 16 per voyage in Antarctica. Participants are part of a guided paddling group utilizing exceptionally stable tandem sea kayaks with one or more qualified sea kayak guides leading each group and helping people in and out of the kayaks at all times. There is always a dedicated safety Zodiac (security boat) accompanying each paddling group who receive a comprehensive orientation and safety drill before getting into the kayaks. Guests also don polar‐quality Kokatat paddling suits and paddling-specific life jackets as well as other gear that along with the kayaks are checked and maintained prior to each cruise. Guests can expect a real workout on these excursions that are on water sometimes for up to three hours, requiring paddling for up to six nautical miles or 10 kilometers. A kayak adventure may be unscripted and spontaneous depending on ice, weather and wildlife. Those wishing to kayak must subscribe to the club for a supplemental fee of $595 (Arctic voyages) or $750 (Antarctic Peninsula voyages) / $850 (South Georgia and Falkland Islands voyages). About Sea Spirit: Sea Spirit was built in 1991 as the Renaissance V, then sailed for a decade in Alaska and worldwide as the popular Spirit of Oceanus. She underwent technical improvements for polar cruising in 2010 and now provides expedition cruises as Sea Spirit in both the Arctic and Antarctic environments. She offers all-suite accommodations for up to 114 passengers, a restaurant that can accommodate all passengers in one seating, library, the comfortable multi-purpose presentation Oceanus Lounge for educational programming and entertainment, and outdoor deck space for al fresco barbecues and to enjoy the passing scenery. Activities are directed by a team of experienced polar guides and educators, and include Zodiac excursions, hiking ashore and optional kayaking on some itineraries, along with informative presentations aboard. The ship’s staff-to-passenger ratio of 1:9 is one of the best in the business. Full details on polar cruise adventures, including for 2017 and 2018, can be found at https://poseidonexpeditions.com/ or by contacting the North American office at SalesUSA@poseidonexpeditions.com or by telephone at 347-801-2610. In Germany, Austria and Switzerland, contact Poseidon’s Hamburg office – Hamburg@poseidonexpeditions.com or telephone +49-40-7566-8555. In the UK and elsewhere on the globe, contact Sales@poseidonexpeditions.com or telephone +44-870-068-9142.